Embarcadero released some new styles for Delphi XE7 Firemonkey with support for the Android 5 Lollipop look. There are three styles included which are a Dark style, a Dark Blue style, and a Light style. Sarina DuPont has a blog post up which highlights the styles and includes a code snippet on how to apply them to Android 5 devices. In the code snippet you basically detect which version of Android is running and then set the form StyleBook property to a TStyleBook that contains one of these three styles. We’ve talked about Android 5 Lollipop support in Delphi XE7 Firemonkey before here and you can download a Hotfix for Delphi XE7 which fixes a minor issue with Android 5 support. There are not many users running Android 5 right now according to statistics but that will only increase as time goes by. These styles probably also work in Appmethod. 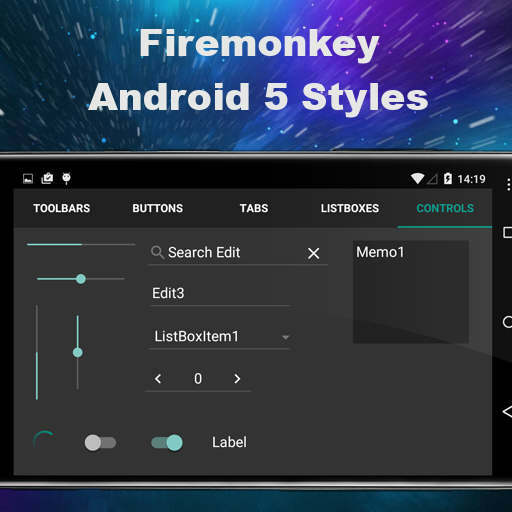 Head over and check out the full blog post about the new Android 5 styles for Delphi XE7 Firemonkey. Download the three Android 5 styles directly from the Embarcadero Code Central site.